The preparation for ConnTESOL’s annual conference is upon us. Attached you will find the form for this year’s opportunities for sponsorship and making contact with many professionals within the field of TESOL. Our keynote speaker is Dr. Michael Long, an expert in second language acquisition whose most recent book is a guide to understanding and implementing Task-Based Language Teaching (Long, Mike. (2015). Second Language Acquisition and Task-Based Language Teaching. Wiley-Blackwell). This year’s conference is at 85 Sigourney Street, Hartford, Connecticut, on October 20th. We are looking forward to seeing you this year, and if you are returning, we appreciate your continued support. 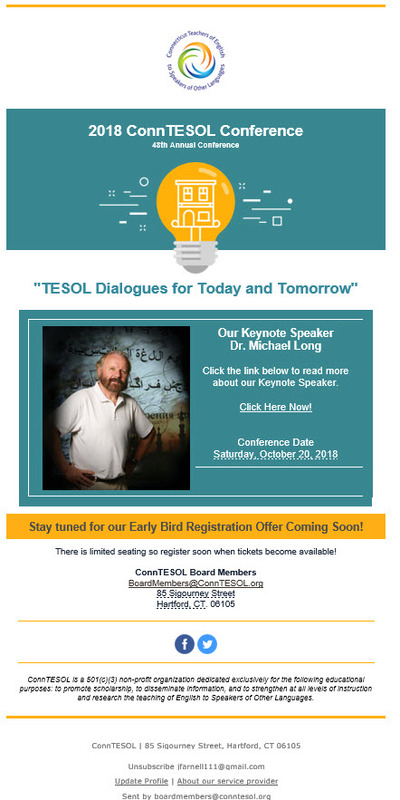 ConnTESOL 2018 Call for Proposals is now available! Please see the conference page for full details. We are looking forward to receiving your proposals! Our 2018 Annual Convention is scheduled for October 20 in Hartford and will feature Dr Michael Long as the keynote speaker. Attached you’ll find our ConnTESOL Conference Flyer with more information. Take advantage of our Early Bird Discount, Today! Over 15 workshops to choose from! 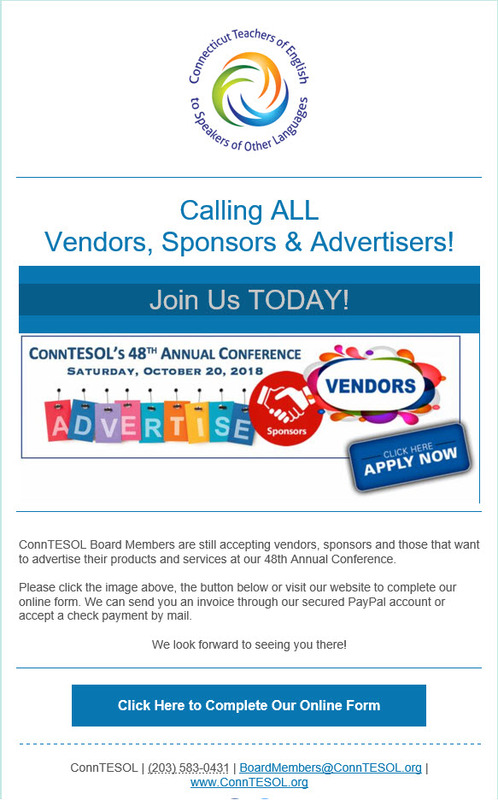 Registration for ConnTESOL 2017 is here! The 27th ConnTESOL Conference is coming! The early bird price is $85.39 and is available until September 30, so mark your calendar, get your tickets, and spread the word. The Board is looking forward to seeing you all there. We are eagerly looking forward to another innovative and engaging conference. Seating is limited, so if you plan to attend, please register as early as possible. Looking forward to seeing you all there and sharing ideas, experiences, and a sense of community! Hello fellow educators! I know we are in the chaos of classes ending, summer classes beginning, etc, but please, if you could take a moment out of your hectic schedules to consider submitting a proposal for Conn TESOL 2017, it would be greatly appreciated. So often we don’t realize our classroom practices, which are so “normal” and familiar to us, may be very novel and innovative to our peers. Peer observation and collaboration have been shown to be some of the most effective types of professional development, as well as educator led initiatives. So please, think about what makes you and your students inspired, passionate, and successful and if those practices could transfer to sharing in a presentation to fellow educators. The full guidelines are linked below but the call for proposals is actually quite simply — a short synopsis of your presentation is all that’s needed now. Then you have the next few, hopefully quieter, months to pull it together. Now more than ever, we need our community to come together and share our outstanding work that we do for our students. Thank you!